I love the ritual of putting up and decorating the Christmas tree. It's always more fun with the help of family members and we sing along to Christmas Carols as we go. When we've finished, as night falls, we sit in the darkness watching the twinkling lights and celebrate our creativity with a festive drink! Perhaps we should all have a stairway to nowhere in our homes - apparently it makes it a breeze to put the star on top of the Christmas tree! Ooops - I didn't really think that one through, did I? 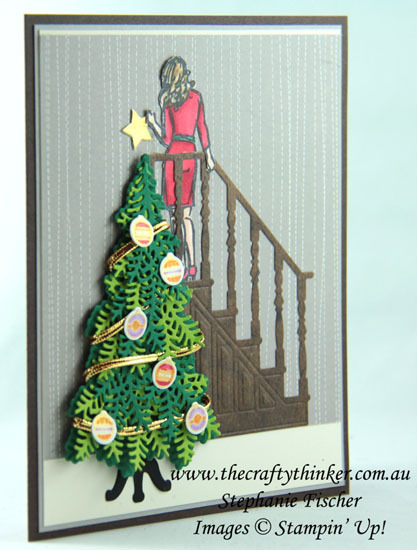 The Christmas tree was adhered with Stampin' Dimensionals to add depth to the card. I decided to place the table legs under the tree because the composition seemed to be lacking something - perhaps this lady likes the convenience of an artificial tree. The little baubles are stamped with Vegas Gold Shimmer Paint and coloured with a variety of Stampin' Blends alcohol markers.